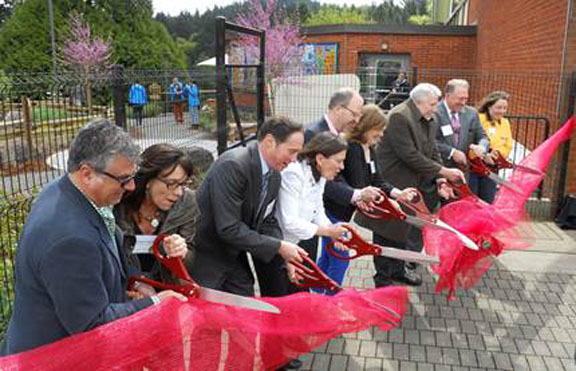 On Earth Day, April 22, the Portland Children’s Museum swung their gates wide to the new Outdoor Adventure. The museum invites children of all ages to explore this education-based, accessible, imagination-fueled, nature play space designed by Mayer/Reed. From the moment the ribbon was cut, I witnessed energetic, gleeful children skipping, jumping and climbing throughout the space. The most adventurous scaled part-way up “Zoom” an enormous, open-branching cedar; while the rest scrambled around boulders and throughout the sloping meadows. Happy feet romped down trails and leaped from stone to stone in the little creek. Small hands sailed wooden boats down to a bridge, fashioned habitats of loose natural materials, and excavated for treasure in the sand pit. As families filled the stone-lined amphitheater, warm tones of the marimba band rose from the lower pavilion, creating an irresistible urge to dance. 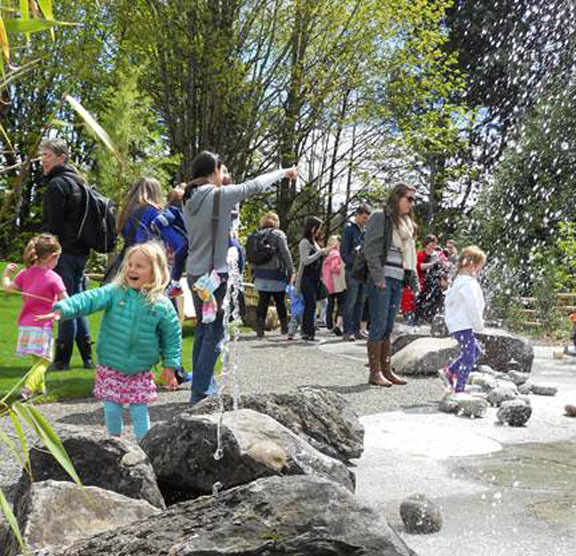 As a landscape designer it’s always a joy to experience our completed projects in use, and this opportunity to see kids connect to nature is especially fulfilling. Next up, throughout May, I get the chance to work with artist Patrick Dougherty on the new Stickworks installation at the lower Outdoor Adventure meadow. Stay tuned or come watch us bring to life a sculptural vision of the ultimate play environment! Jeramie Shane is Associate Partner of the Landscape Architecture and Urban Design group. Jeramie is a strong collaborator who distills the best design thinking from clients and teams. Through his relationship-building skills and thoughtful leadership style, he keeps an experienced eye on the big picture while enriching projects down to the details. Jeramie joined Mayer/Reed in1998 and is a registered landscape architect. He has been involved with much of the firm’s most prominent work, including the Vera Katz Eastbank Esplanade, Nike World Headquarters North Campus Expansion, and the Mirabella Portland in the South Waterfront District. Current projects include the Daimler North American Truck Headquarters and the Portland to Milwaukie Light Rail. Jeramie holds a Bachelor of Science degree in Landscape Architecture from Washington State University; and is a member of the AIA/APA/ASLA Urban Design Panel in Portland. Kathy Fry is Associate Partner of the Visual Communications and Product Design group. A forward-thinking leader, Kathy inspires teams with her creative vision and clear design direction. Her critical decision making abilities and organizational management skills contribute greatly to the success of the firm. Kathy joined Mayer/Reed in 2008 and has 12 years of experience in signage, wayfinding, interpretive graphic design and branded spaces. Projects include museums, hospitals, libraries, office spaces, airports and universities. Significant projects designed and managed for Mayer/Reed include the Bud Clark Commons, Vancouver Community Library, San Ysidro Land Port of Entry in San Diego, and site furnishings and signage for Sound Transit and TriMet. Kathy is a graduate of Portland State University with a bachelor’s degree in Graphic Design; and serves as co-chair of the Portland Chapter of the Society of Experiential Graphic Design.